A visszaállás nehézségeit növelte, hogy a hét elején egy sürgős megoldandó feladat került az asztalomra, ami eredetileg nagyjából egy órás munkának ígérkezett, de hamar olyan nehézségek kerültek a felszínre, melyeket végül majdnem négy napba tellett 100%-ban megoldanom. Így az első napokban totál rossz hangulatom volt, ami szerdán abban tetőzött, hogy estére már fizikailag is rosszul éreztem magam, és nem is mentem floorball edzésre… Szerencsére aztán ahogy csütörtökön meglett a megoldás, egyből sokkal jobb lett a közérzetem. Ráadásul este a Via Via-ban vacsoráztunk, isteni Lasagne-t ettem, és szuper söröket ittam :) Fokozandó a jókedvemet, pénteken a szokásos szeminárium után odajött hozzám az intézet igazgatója egy kicsit beszélgetni, és elmondta – többek között – hogy nagyon tetszik neki a La Palmá-n készített film (ami a kari PR értekezleten is központi szerepet töltött be), és hogy nagyon hálás hogy így segítek az intézet, a tanszék és a távcső népszerűsítésében :D Szóval végül is nagyon jó újra itthon. Ha szombat akkor shopping, nincs mese. Igazság szerint hosszas gondolkodás után rászántam magam hogy vegyek egy iPhone 4-est, de természetesen sehol nem lehet kapni, hetente érkezik pár darab, szóval majd próbálkozom még… (Számítottam rá, szóval nem ért meglepetésként.) Azért nem mentem haza üres kézzel :) Főleg a hét eleji rossz élményektől vezéreltetve vettem új lámpákat a biciklimre: előre egy új (meglepően) extra erős LED-vel szerelt Knog Frog Strobe-ot, hátra pedig egy Cateye TL-LD610 került (sajnos utóbbi nem volt feketében). Most olyan brutálisan fényes vagyok, hogy arra nincs szó :) Ezen felül végre vettem egy Lonely Planet Belgium utikönyvet (ugyan már a fél országot kívülről fújom, de ez sosem árt)! Meg persze csokit, de hát az alap. Este DVD-ztem: Leap Year (könnyű röhögős romatikus, a kellemes fajtából, csöpögős befejezéssel) és Invictus (igazán inspiráló film – I am the master of my fate, I am the captain of my soul). Végül pedig álljon itt a lista a héten megízlelt új sörfajtákról: Leffe Radieuse, Kriek Boon 2009, Mort Subite Kriek, Mort Subite Kriek Xtreme, Lindemans Kriek. (Utóbbiak közül talán a Boon volt a legjobb.) Már csak egy sör áll köztem és a századik belga sör között ;) Hamarosan centenáriumi bejegyzés következik tehát! This entry was posted in Uncategorized and tagged film, mindennapok, munka, phdinleuven, sör, sport, vacsora on October 31, 2010 by Péter I. Pápics. Holidays in Santa Cruz – 2. After a restful day, I went cycling again. 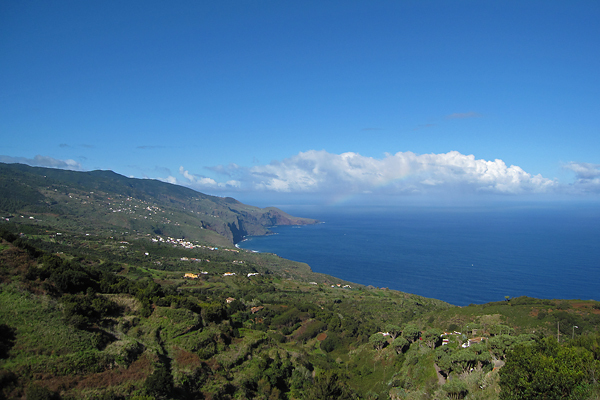 This time I wanted to ride to the north along the eastern coast of the island, then turn to the west, and climb the highest peak of La Palma from the northwestern direction. I knew it would be hard (with more than 120 km and three and a half kilometer of elevation gain, on the steepest roads of the island), but we need challenges in life :) I had my breakfast sitting at the open window (that’s something I will miss in Leuven, but finally I will have my chocolate, fries, and beer ;D) and watching the sunrise over the calm see towards the island of Tenerife. I had some difficulties inserting my contact lenses (everything is great about lenses, but I don’t like this part), so it was already half past 9 by the time I managed to leave the apartment. The road usually went around the ridges, but sometimes there were tunnels also. I knew this would happen, so I put my rear light on already at the beginning, and just turned it on when I saw a tunnel approaching. But at the last and longest one, I went in as usual, but then it turned out that there is absolutely no lighting inside, and as the end was not visible from the first hundreds of meters, it became completely dark very soon. Luckily, for safety reasons, I also put my headlamp in my backpack, so I stopped in the darkness, and put it on… But it was really shocking to roll in with 40 km/h and then realize that the road disappears in the darkness :D There were also some sections, where one lane was closed due to road-works, and the traffic was controlled by traffic-lights, so I had to wait sometimes several minutes to get a green sign (and I usually managed to pass the section before the other direction got the green). So after a bit more than 60 km and an elevation gain of two kilometers, I arrived to the start of the climb at an elevation of 940 meter ASL. From here, it took 19.4 km to climb 1485 meter to the Roque de los Muchachos, which gives an average slope steepness of 7.7%, making this the most difficult climb I ever had (maybe even without taking into account the two kilometers of elevation gain already in my legs at the beginning of the big climb). The first kilometers were quite OK till the point where I had to turn to the TF-4 road from the TF-1 (which I was following from Santa Cruz), then came the brutal section. Really, it did hurt. In 1.8 km I rode up 200 meters, which translates to an average steepness of 11.1%, and also a nice amount of lactate in your legs ;) But this is only the average, there was a curve-combination (looking down you could see three two more “levels” of the road below the one you were riding on), where it went up to 15% for quite a long section. (There were two buses coming down, and the drivers were waving and smiling when they saw me – but this was the case with most of the cars I met on the way up, which felt really good.) Of course the forest and the scenery was amazing, the sky was deep blue (with no clouds on this side of the mountain), but I was really tired to take pictures, I think I just wanted to concentrate on the climb itself. I already knew the way down from two days earlier, but it was still a challenge with the numerous steep curves. Luckily the road was less wet now (though it was still not cloudless on this side of the mountain), and as I did not receive another tropical rain-shower as a present from mother nature this time, I hade really nice views after I came out of the cloud layer. It was a really well spent day. After taking a shower, I slept a bit (yeah, I was tired as hell) before I went for my usual dinner. You coud really tell that the waiter was really happy to see me again – as I had my dinner at the same small pizzeria every evening (I already had my favorite spot). They served great pizza (though not the best I ever had, but close to it), and I liked the atmosphere of the place. Moreover, I usually payed only 10 € for everything with tip included, which is at least 50% more in Leuven. But this was also true for the supermarket, I was always surprised how cheep my purchases were. This morning (after the usual breakfast wit the view to the sunrise over the sea… – boring :D) I packed in everything (now I am a really professional bike disassembler and packer), the took the taxi to the airport, and now I am flying over Portugal on the way to Madrid. Hopefully everything will be fine and I (and also my luggage) will arrive around 10 PM to Brussels, so I might be in Leuven still before midnight. If I manage to post this post then you know I am fine (and if not, then this sentence does not make any sense, but hope for the best :D). This entry was posted in Uncategorized and tagged bicikli, cycling, english, holidays, la palma, nyaralás, phdinleuven, pizza on October 25, 2010 by Péter I. Pápics. Holidays in Santa Cruz – 1. On the 20th I finally took the taxi and left the mountaintop behind. I asked for a big cab at the reception (because of my bike box) of the Observatory, but I did not expect a mini van :D The driver was very nice, we talked about cycling almost all the way down. I went directly to my apartment (La Fuente), where I got the keys, but as I had to wait till noon before I could move in, I decided to go for a short walk in the city. 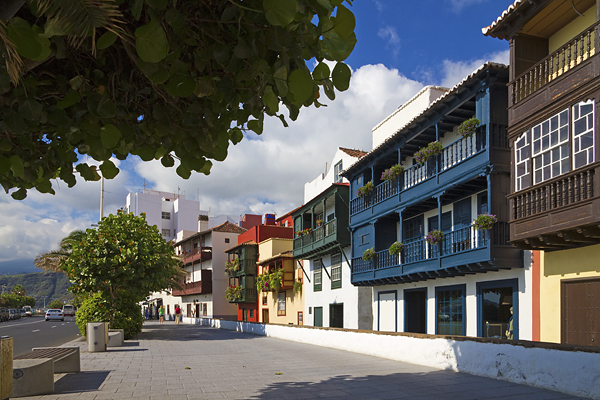 Santa Cruz de La Palma is really nice, I am not a huge fan of the Spanish (or Latin) style, but these small streets with the wooden balconies are lovely. As the Queen Elizabeth was in town (I mean, in the port), the old part of the city was flooded by mostly old European and Japanese tourists… In theory, it was only 26°C (in the shadow of course), but after the climate of the Observatory (at 2150-2350 m ASL), I was really sweating like a horse down at sea level. I had lunch at the new port building on the terrace of a nice modern pizzeria (where all the pizzas were named after old Hollywood movies), then I walked back to the La Fuente. My apartment is on the 4th floor, which has pros and cons. First of all, I have a view to the sea, and the sunrise (which is just awesome), but I had to carry up the 32 kg bike box in the narrow staircase, which was quite a difficult job… Anyway, it has a very good price/quality ratio. When I left Santa Cruz, the Sun was very strong, so I started to worry a bit that leaving the rest of the sunscreen at the apartment might turn out to be not my best idea ever, but then I entered the cloud layer at around 800 m ASL, and I spent almost all the rest of the ride in there… Around 400 m ASL small dogs started to follow me while barking loud just 10-20 cm from my feet, but luckily it was still a bit too early for lunch :) (Normally dogs are not a big deal, as I can go faster than them, but not uphills on a 8% slope…) This was a much harder climb than the on on Tenerife – almost as long, but significantly steeper. 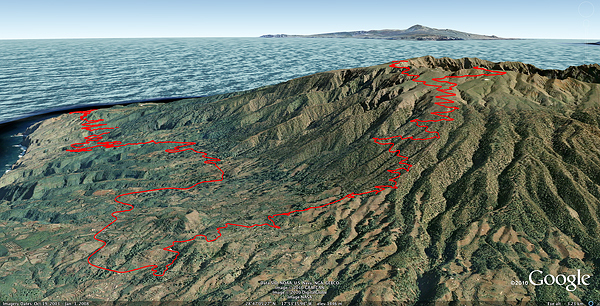 It consists of three parts: 33.62 km @ 6.8% from 5 m to 2285 m, then 5.20 km slight up and downs (average @ -2.7%), and finally 3.67 km @ 7.2% from 2147 m to 2411 m (with sections as steep as 11% at the last hundreds of meters – which really did hurt). 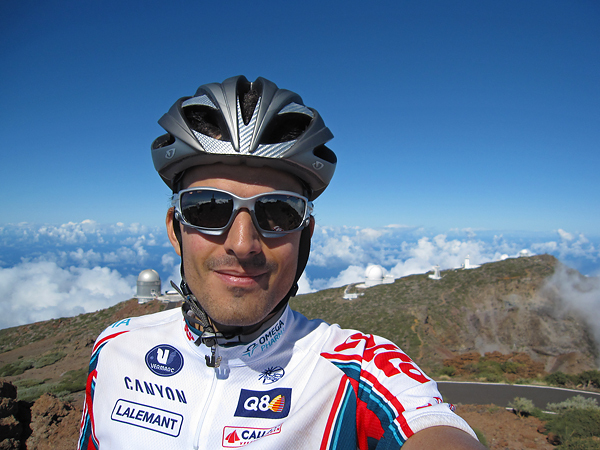 I saw the Sun again at ~2200 ASL meter for a couple of minutes while I was pedaling up through the area of the Observatory, but that’s all – the peak (Roque de Los Muchachos) was in the clouds again already by the time I arrived. 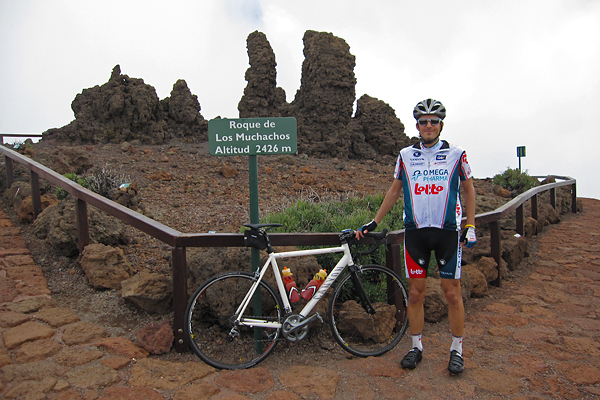 It took me almost 3 hours and 20 minutes to ride from sea level to the top of La Palma. Before I started the descent I put the arm and knee warmers on, plus the cap under the helmet, because the weather was quite chilly up there. Unfortunately it did not improve on the way down, but it started to be quite wet at around 1200 m ASL – which gave me a bit of a trouble in one of the many corners, but my experience (unclipping the SPD shoes when realizing that breaking is not effective enough for such a steep curve) saved the day for me :) To put the icing on the cake, it started to rain cats and dogs (with really big, but luckily quite warm drops) at around 400 m ASL, which lasted till I reached sea level. The road turned into a river almost immediately, so I had to be extremely careful, because 180° turns on flowing water are not that easy. I got completely soaked, I have never been so wet on the bike before. As soon as I arrived home (and took a shower) I put my cycling shoes out into the window, and it was still a bit wet after drying for 20 hours there. So all I want to say that it was really like a tropical rain storm. This entry was posted in Uncategorized and tagged bicikli, cycling, english, holidays, la palma, nyaralás, phdinleuven, pizza on October 23, 2010 by Péter I. Pápics. 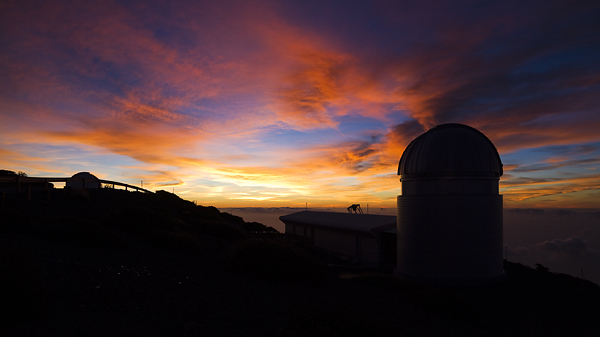 I finished 10 minutes before the start of the twilight on night 3, so as I had no targets which could have been observed in such a short time, I decided to turn the telescope towards something visually stunning to create a proper outreach (PR) picture for our Institute, and the Mercator Telescope. The result is shown below :) The idea that we should release something like this once every month is supported by the staff at the telescope too, so that’s the reason why I made such a labelled version. 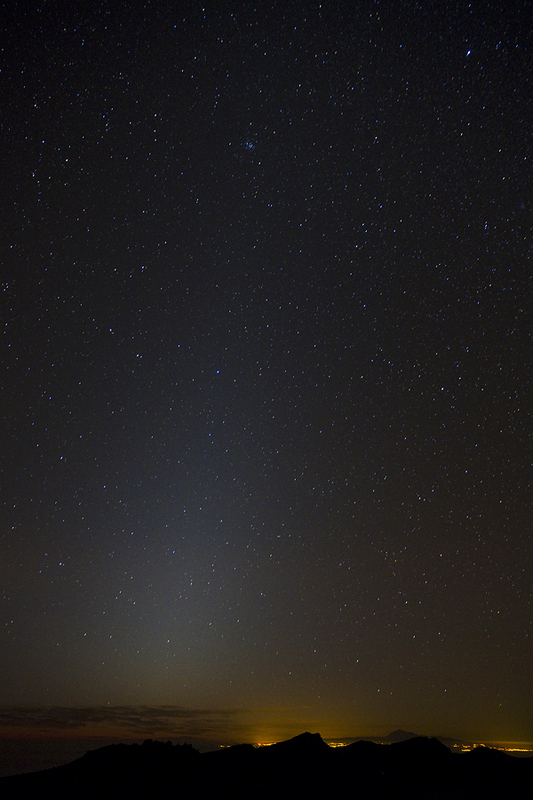 My last lonely night turned out to be much more busy than planned, as the students from Leuven and Amsterdam were already at the observatory that evening. So while I was observing, they had their project presentations in the control room, which in one hand was quite interesting, but on the other hand, I could not work on my article… (I have to admit I have serious problems concentrating on it here.) The night itself was not the best, we had a lot of cirrus clouds (creating an amazing sunset – see below), and the seeing was also not that good. Then I had to close the dome for the last hours, because the clouds came up again… Even with far from optimal conditions, I managed to observe almost all the targets of the program, so it is OK. 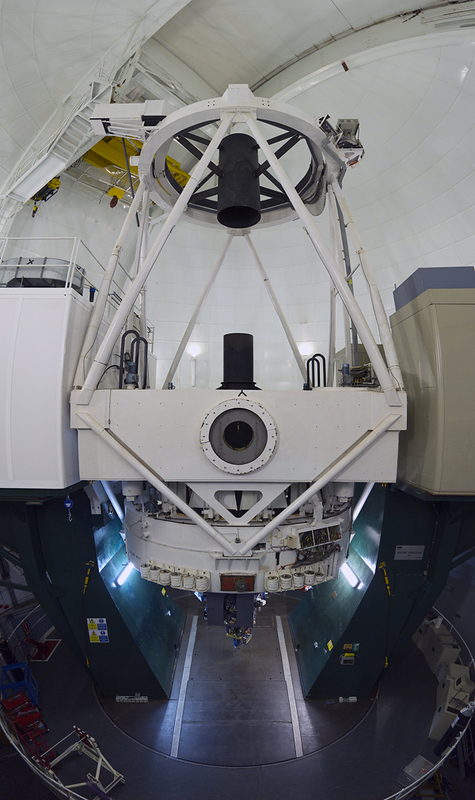 The WHT is really huge (for scale, look at the monitor in the bottom right corner), it has a mirror diameter of 4.2 meters. Mercator feels a bit smaller since we saw this :S We got a short introduction to the research done with the WHT, and a tour around the telescope itself. We even got a chance to take pictures of ourselves in the main mirror :) It was really impressive. The clouds and I stayed until sunrise (the students went down to sleep at around 3 AM), too bad that I am only productive in the last hour of the night. 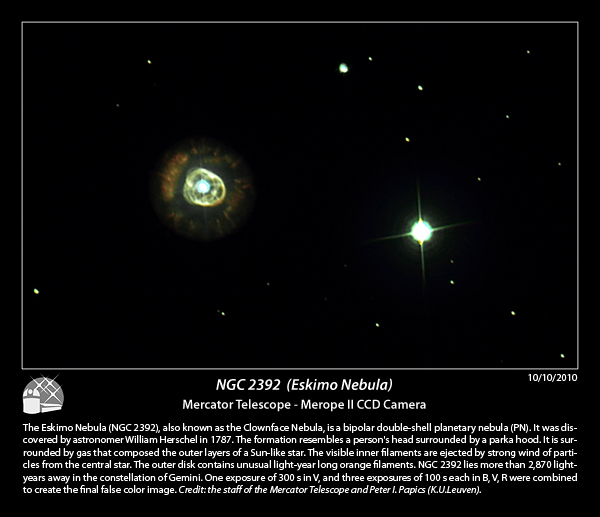 I guess this messed up day/night rhythm is not really good on a long term… Anyway, I still love observing. 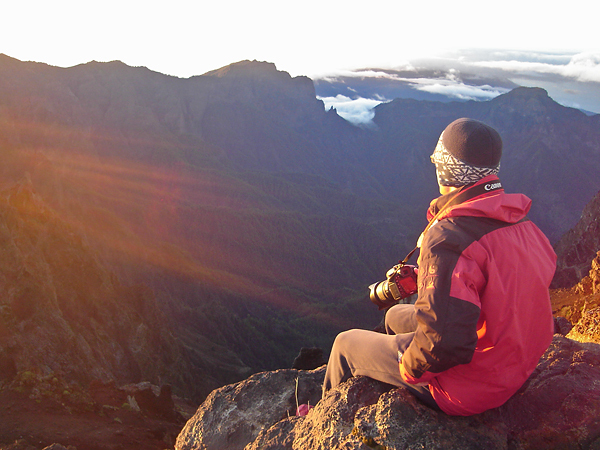 This entry was posted in Uncategorized and tagged english, észlelés, fotó, la palma, observing, phdinleuven, photo, pr, video on October 13, 2010 by Péter I. Pápics.